And no the answer isn’t “those who get paid”. Many of us do have talent to start with. You may be really good at your own makeup and get lots of people asking you to do theirs! Sure go for it! Otherwise how else are you going to figure out if you are good at OTHER people. And what if you just really love makeup so much? You day dream about being super cool, working with celebs and starting new trends but you aren’t even sure about how to really go about it all. Getting ipsy bags and spending a grocery bills worth at Sephora might be a good start, but you can also over load yourself with too much product that you don’t know how to use. My answer is one word: Practice. Practice makes perfect and seeing as there are always new trends, new products and new tools; you’re always practicing. Try out social media makeup challenges. Try to copy famous looks, go look at high fashion from different decades and try it out! Get social too! Make sure to take pics of trends you’re trying, looks you’ve done that you love. Create a online portfolio so people can see you grow and evolve. This is another good way to get jobs. The next step is the biggest step towards becoming a pro mua: A Formal Education. I stressed formal because as much as there are small classes you can take for seasonal new products or short catch up classes, nothing beats a full out formal 6 months to a years education. I am not saying you aren’t a professional without a formal education, I know many pros who are wonderful, professional and talented and they only have small makeup courses. Working at some cosmetic stores, once you’ve worked there long enough: they do send you away for formal training. With a formal education you will learn how to use all the types of products, how to work with different skin tones, face shapes, eye shapes, how to put in accessories like lashes and more; all in one go. Most importantly you will learn infection control! I don’t how many times I’ve herd clients tell me that they’ve used a makeup artist who used a dirty/used blender sponge, used their own makeup on them, old pencils, used the mascara wand that comes out of the tube and more horror stories. There are multiple ick factors at play with any of those above mentioned practices: skin bacterial infections, giving someone pink eye (which can cause blindness), or giving someone herpes. The last one has more consequences than most consider; now the client has herpes, they might spread it to their spouse. The spouse might accuse of cheating or being gross..now they both have to go to the health unit and report it and stir up just a sh*t load of drama and you might end up ruining a relationship and a life because no one will probably ever come to the conclusion that it was a contaminated lipstick pencil that spread the outbreak. When you get out of makeup school or even if you just want to start working as a makeup artist: you will need a kit. A makeup kit will have all your products and tools in it. There are many different types of kits depending on what your level and kind of work is. Some places like working in a makeup store, well the store is your kit essentially. You can buy full kits from different companies, the school will have a kit for you to buy as apart of your course, or you can make your own with products from different brands that you like. You can even use what you’ve gotten from sephora shopping sprees and unused ispy makeup. What your pro kit isn’t is what I already talked about: your own personal makeup and tools that you use daily. Let’s be honest when it comes to our own selves and homes, girls can get gross. So unless you are disinfecting and sanitizing your brushes and makeup after you’re done using it, you shouldn’t be using it on client’s skin. Okay, so now you have everything lined up, you have honed your talents at school, you’ve worked at the MAC counter for sometime now, and you are confident! You want to take clients but how? Don’t quit your day job yet if it’s not already working in the industry. Gaining clients takes time, there are highs and lows of different seasons too. When talking to a new up and coming local makeup artist a few months ago, he had the same thought: “I don’t have a room at home to dedicate to a makeup room, and renting a space is expensive.” I told him be mobile. When I first started I drove to all my clients houses and did it at their kitchen tables, or had them come to my house and do it at mine. I might not sound glamorous but when you are first starting it rarely is. I worked my way up in having clients and was able to make a spare room into a little spa room. And now I have my own spa with its whole makeup area (which I am still working on). 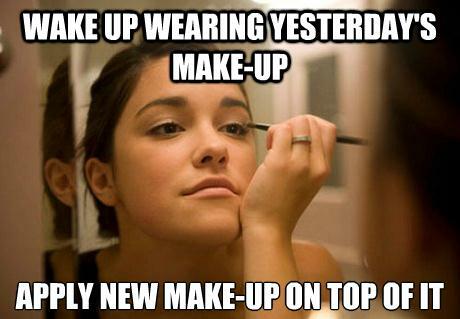 And for some pro mua’s being on the go is the way it is. It’s just usually how it is, you do makeup on set for film and photoshoots, you go to where the bride needs you to go. I actually rarely have clients in my shop doing makeup expect for intensive days like halloween and then the regular makeup lessons, photoshoot models who aren’t in a rush, bridal trials, date nights, and prom. Gaining clients can be hard, but its harder if you think some jobs are below you and you turn away work. Take any job. I did kids face painting at different events at churches and parks. I drove all over town on halloween nights going to and from client’s homes, even for easy stuff that doesn’t pay much. I did tons of work for free or at cost to collaborate on student films, and new photographers needing different models. You will gain a good reputation, gain clients and gain partnerships with other professional who can call upon your skills for future projects. I got started at the Community Auditorium as a on call makeup artist through a referral from hairstylist friends I have. My first job was a makeup artist’s assistant for “Shrek the Musical”, then they called me again to me the makeup artist for Shelby Chong of Cheech & Chong. One small gig turned into working with my first celeb. Gaining all this experience and education is great but the main key word in this whole idea is PROFESSIONAL. Which means have professionalism. You can be talented, have a good education, have some clients and have a great online portfolio but if you aren’t professional you aren’t going to get far. Watch things like how you dress, how you do your own makeup, hygiene, how you speak and how you act. If you are always late, or cancel appointments last minute because you were out partying all night: you won’t be getting recommendations from clients. Showing up to a clients home and drinking all their wine when they offer you some, or eating all their food. Do you need help or wish someone could show you the ropes still? Seek out a mentor. Find someone you respect, who has lots of experience and you can ask to sit down and have a coffee to ask them questions. You may even ask to be their assistant on a job to see how they work. You can schedule time with them for you to do their makeup or them to you do and talk through the process. Follow this list and keep these in mind and you will be on your way to becoming a professional makeup artist.